Is your pedalboard growing? Gain more outputs by connecting additional Ojai units to the 24V Thru jack. Or use Ojai R30 to add five more outputs to our Zuma power supply (sold separately). Ojai R30 is part of a truly expandable, modular power distribution system that can grow with your pedalboard. Playing gigs all around the world? No need to purchase separate power supplies for your international tour. Ojai R30 has automatic worldwide power compatibility built-in (when connected with the appropriate IEC cable). Whether you’re on 120V, 240V, 100V, or any variation in between, Ojai R30 will deliver clean, reliable power to your pedals, even if the venue has dirty power. Ojai R30’s all analog circuitry offers two stages of isolation. Each of the five output channels is individually isolated from the 24V DC, and the 24V DC is isolated from the AC input power, eliminating ground loop and AC line noise issues. Ojai R30 also provides dual power regulation: Wide-bandwidth optically isolated feedback loops on each channel, as well as on the input, allow both the input and outputs to adjust for changes, ensuring solid output under changing load conditions. Don’t let the blue chassis fool you: Ojai R30 is green at heart. Significantly more efficient than linear power supplies, Ojai R30 is able to deliver substantially more current while handling a much wider range of input voltages. Ojai R30’s high efficiency design delivers high-current power distribution in a compact unit, for a small carbon footprint and a small pedalboard footprint. Ojai R30’s ultra-low profile design means that it can fit under just about any pedalboard. It also features built in threaded hardware for easy mounting. Connect your pedals here with the included cables. Three outputs provide 500mA of available current at 9V and have center negative polarity. LED indicator illuminates green when cable is connected. Two outputs provide selectable 9V, 12V, or 18V DC, each with center negative polarity. Each output provides 500mA of available current at 9V, 375mA at 12V, and 250mA at 18V. Connect the included 24V power adapter here. Gain more outputs by connecting another Ojai (sold separately) here. Connect the included IEC cable to the power adapter. Connect the power adapter to Ojai R30 here. To make sure your pedalboard delivers the best sound quality possible when powered by Ojai R30, we did extensive listening tests with every pedal we could get our hands on, and we audio test each and every unit in our lab. In fact, every Strymon power supply unit goes through the same rigorous Audio Precision testing that our pedals go through. 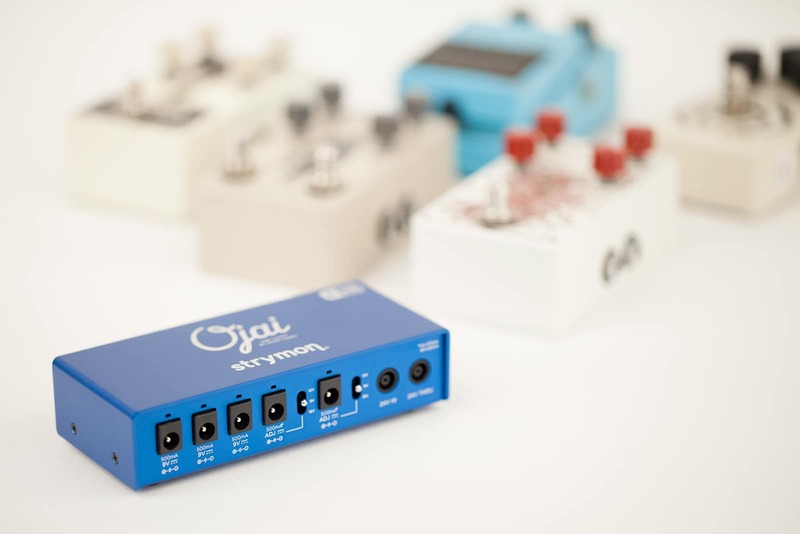 With Ojai R30, your pedals will sound the way they were designed to sound. What are the dimensions and weight of Ojai R30? When Ojai R30 units are linked together, how many pedals can I power? Ojai R30 provides a huge amount of power. 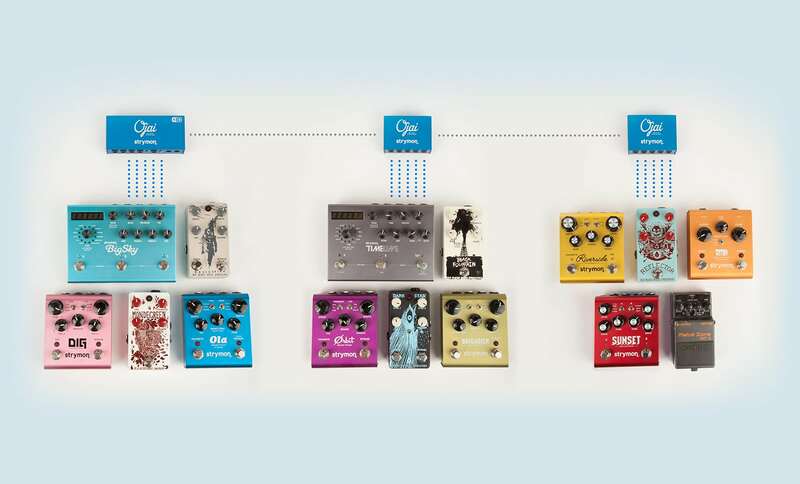 You can link together as many as 7 Ojai units powered from one 24V power adapter, powering up to 35 effects pedals (depending on the total current requirement for the pedals). While it’s unlikely that anyone would go to such extremes, we wanted to ensure that the Ojai product family delivers maximum flexibility and expandability. A much more likely scenario would be to link 2 or 3 Ojai units together, powering a combination of up to 15 high and low current draw pedals. How can I mount Ojai R30 to my pedalboard? Ojai R30 features built in threaded hardware for easy mounting to the top or bottom of most pedalboards. A drill template and mounting screws are included in the box. Don’t want to drill? Ojai R30 is incredibly lightweight, and can also be mounted to the top or bottom of most pedalboards using VELCRO® or Dual Lock™. You may also choose to mount the included 24V power adapter using VELCRO or Dual Lock.